Simply clip your GoPro® Remote into the housing and you are ready for one-handed telescopic handle filming. 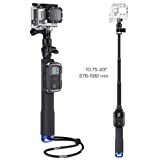 The REMOTE POLE can be extended and twist-locked to any length from 13.6-39″ (330-99mm) Your GoPro® Camera will attach to it without any extra parts. The dual-diameter remote grip keeps the pole firmly in your hand, yet still allowing you to use the remote at the same time.Patent pending. GoPro® Camera and WiFi-Remote® not included. 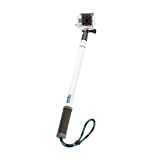 Click Here For Customer Reviews Of The Remote Pole 39″ GoPro-Edition! This compact & easy to use telescopic P.O.V. Pole can be extended and twist-locked to any length from 7-19″. Your GoPro Camera can be directly attached to it without any extra parts. The dual-diameter grip keeps the pole firmly secured in your hand. 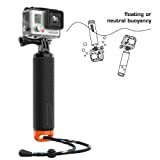 Now you can capture more footage of yourself and your friends using the lightweight and durable P.O.V. Pole. Click Here For Customer Reviews Of The POV Pole 19″ GoPro-Edition! 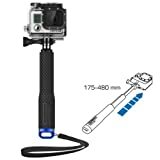 GoPole REACH - Telescoping Extension Pole for GoPro HERO Cameras 17-40"